Discussion in 'Brokers' started by Ramy3, Jun 17, 2013. Hah.. you would start this thread with a music video. So, looks like we are letting anybody in here, lol. Just kidding. Cheers! Oh yeah, Pepperstone performing flawlessly as per usual. Pepper is doing a daily market commentary now. Still waiting on CTrader release. (If you weren't aware, Pepper will be getting CTrader and CAlgo as a platform option.) Should be soon. I emailed in asking if we'd see the new webtrader (which looks slick,) and they responded that they will be getting it as the platform is rolled out to brokers using Sirix. So between Sirix and CTrader, Pepper will have people who like web interfaces covered. Still happy with these guys. Thight executions. Had my doubts regarding the world of Spot FX having done all my Currency trading through CME and hearing the horror stories of Spot. Pepperstone provide tight spreads, crisp executions and stable reliable connection. Dealing with Pepperstone support, back office and trading desk has always been first rate. I recommend Pepperstone and will continue to do so until I report differently. I have no affiliation with Pepperstone other than an active trading account. How did you get a photo of my office? Traded the aeron for the model you see before you. Security guard is posted to keep those annoying Hedge Fund head hunters at bay. Got an email from Pepper last night. 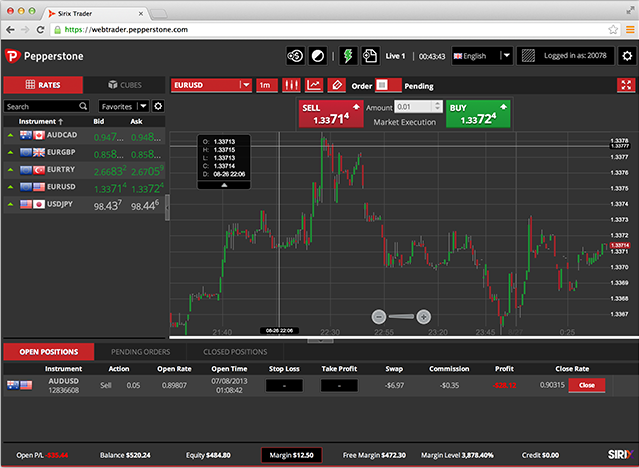 The new web trader by appears to be live. I tried it out and it's a vast improvement over the previous web trader. The new version is rather slick actually..
For those actually intrested in this. The platform itself isn't going to make someone a better trader, it's just a different option that some people are going to like more than others. MT4 still works perfectly well and does the job. I'm just excited for cTrader since I like new toys. That and it opens up C# to write EAs in... MQL4 can be limiting at times. The young bucks challenge to learn and defeat. I get it, been there. But, honestly, I may still be in the old computer age, but nothing for me warrants the need to learn something new at the moment. Time will tell. May take a couple of decades for this to take off on its own. My only thoughts on this for the moment, is its a mass underground campaign done wisely to profit the seller. That’s all it is to me for now. It’s all a game of money and profit no matter how you dress it up. all will end in the same way. Look at LMAX. Techies (like myself) tend to like new toys.. but it's a 'want', not a 'need' for sure. Pepper has gotten a lot of requests for cTrader, so they are also just fulfilling client demand as well. On A serious note; I have no issues with MT4. Besides the trade context busy issue, and that has been addressed with recent updates. Other than that I am happy. It took me forever to figure out their coding, anyways, good luck to you all with Ctrader. LOL.. you sound like we're all leaving you behind. So far, brokers who offer MT4 and cTrader are still seeing ~90% of their user base on MT4. We will all be MT4 users for a long time to come.